Package Include: 2 Push Up Bars, One Resistance Band And One Carry Bag. 1.The Push Up Stands Are Perfect For Muscle Training,Strengthen And Sculpt Shoulders, Chest, Arms And Back, Reduced Risk Of Wrist Injury Or Pain. 2.2. Wide And Soft Grips Help Distribute Weight Evenly, It Protects Wrists And Reduces Pain. 3. Triangle Design Makes The Push Up Stands More Stable And Do Not Wobble. 4. Foldable And Lightweight, No Assembly Required, This Makes It Convenient To Take Them To Gyms Or Outdoor. 5. Grips Are Well Padded, It's Very Comfortable On The Hands. Super Comfortable And Wide Handles- The Grips Of The Push Up Handles Are Padded With Soft Thick Foam, It's Terribly Comfortable, Wide And Ergonomic Handles Allows For Better Weigh Distribution And Protects Your Wrists From Strain. With Double Ripple And Bump Texture Design,The Grips Can't Be Slippery Even If Your Hands Are Sweaty. 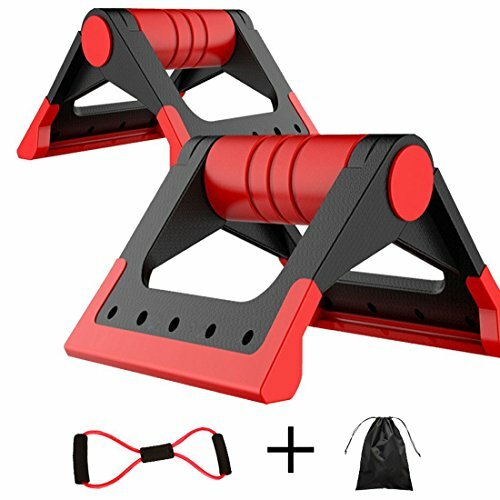 Foldable And Easy To Transport- These Push Up Stands Are Lightweight And Portable, No Assembly Required, It Comes With A Portable Carry Bag And A Figure 8 Resistance Tube For Stretching, Muscles Toning, Yoga, Weight Lifting And Home Gym,Best Fitness Equipment For Traveling or For Gym. Sturdy And Secure Tpr Base- Four Anti-Skid Pads On The Bottom Provides A Lot More Stability, The Pushups Fit For All Kinds Of Floors, Such As Carpet, Granite, Marble, Hardwood Or Tile Floors. Solid And Lightweight Muscle Builder- The Triangle Push Up Bars Greatly Enhense The Stability And Help You Target Specific Muscle Groups - Scapular Muscles, Triceps, Deltoids & Pectorals, And Sculpts Your Entire Upper Body (Arms, Shoulders, Chest, Back, And Core. ), Perfect For Push-ups At Home, Gym, Office, Or Travel. If you have any questions about this product by 8th team, contact us by completing and submitting the form below. If you are looking for a specif part number, please include it with your message.